So yesterday was of course a day for a little . . . Aprilscherz or poisson d’avril . . ., but now I am serious. What you see below transports garbage, which might not impress you–but that unit towed by a single tug replaces 48 trucks between Queens and Staten Island. Spaced for safe driving, that would mean about a mile of highway congested by that garbage alone. Many thanks to Jonathan Steinman for the photo, which he took yesterday afternoon about 4 pm yesterday. 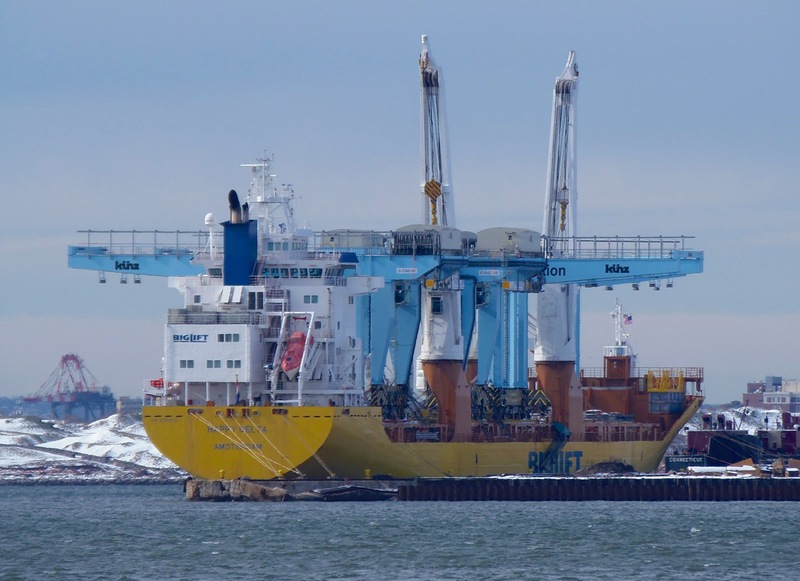 Piecing the whole system together–I hope correctly–here’s a photo I took of Happy Delta in Bayonne less than two weeks after Sandy roared through. 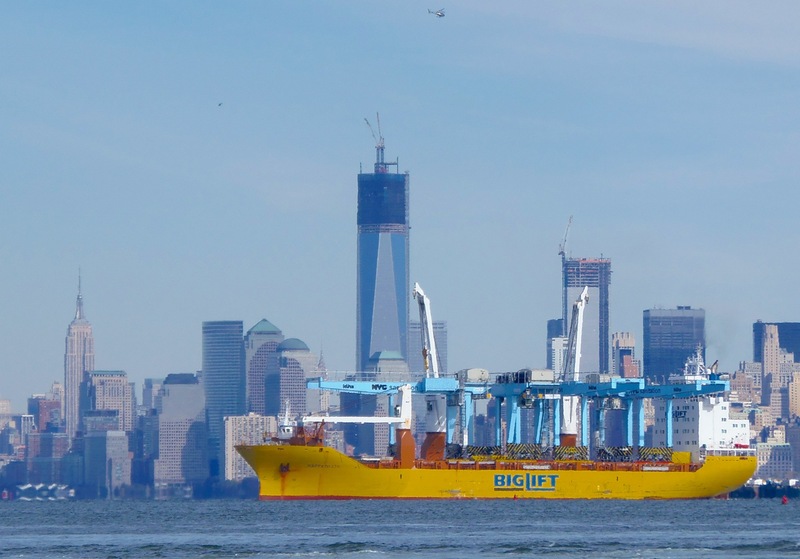 Here’s another shot taken the same day, showing Happy Delta arriving with its cargo, the blue Kunz cranes marked NYC Sanitation, WTC1 serving as the time stamp. Here’s a close-up I took yesterday about an hour and a half before Jonathan took his. 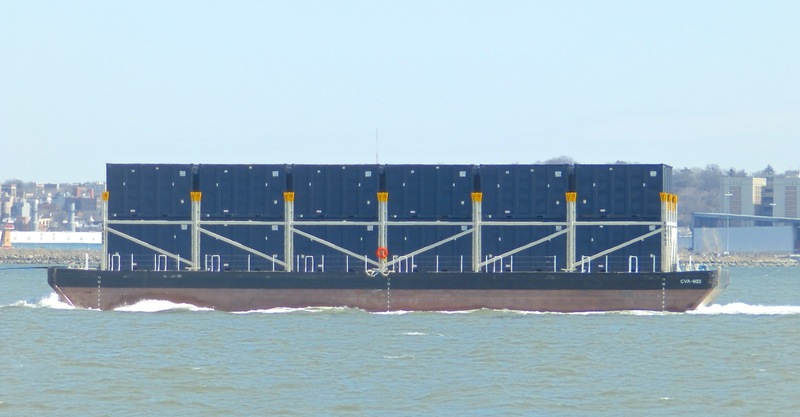 Here’s the story, six of these barges were built by Senesco and completed last summer. Here’s the story in print about the time the order was placed. Each barge carries 48 sealed garbage containers. 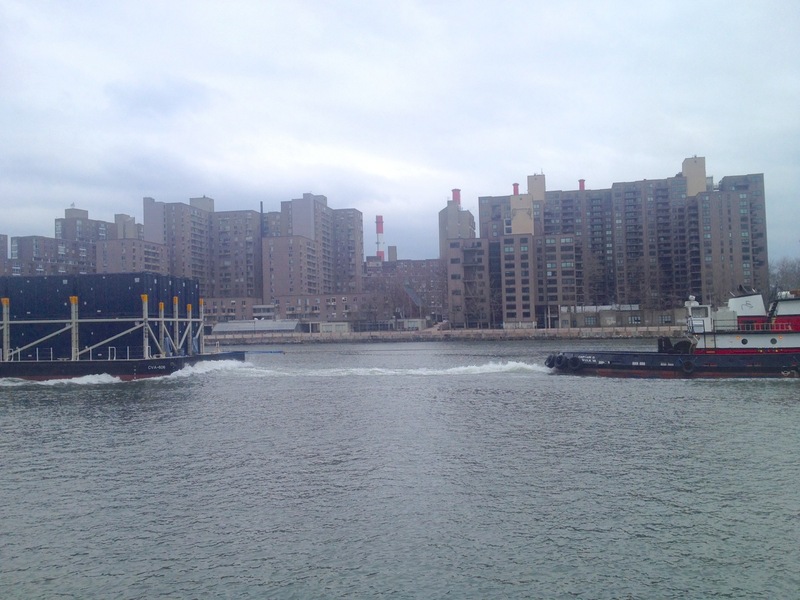 The barge is light here, heading for an eastbound passage on the East River. 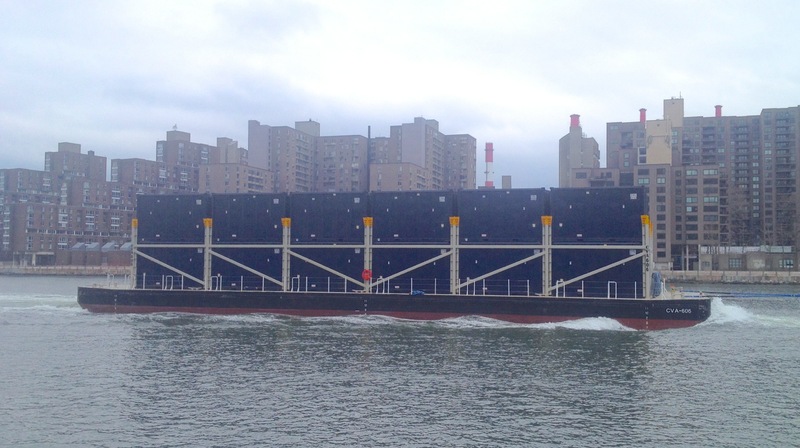 Compare the freeboard above to that in the next two photos, which Jonathan took half a week ago, as the tug and barge headed westbound–and south–on the East River. Another four feet or so deeper in the water. That’s a load of garbage that’s not making potholes and stressing the BQE and other roads. And where’s it coming from with empties? Here’s the answer in a recent SIlive version of the Advance. I haven’t gotten over to the south side of the Goethals Bridge yet to confirm what I think is there . . . those blue Kunz cranes. Anybody confirm this? Am I way off? 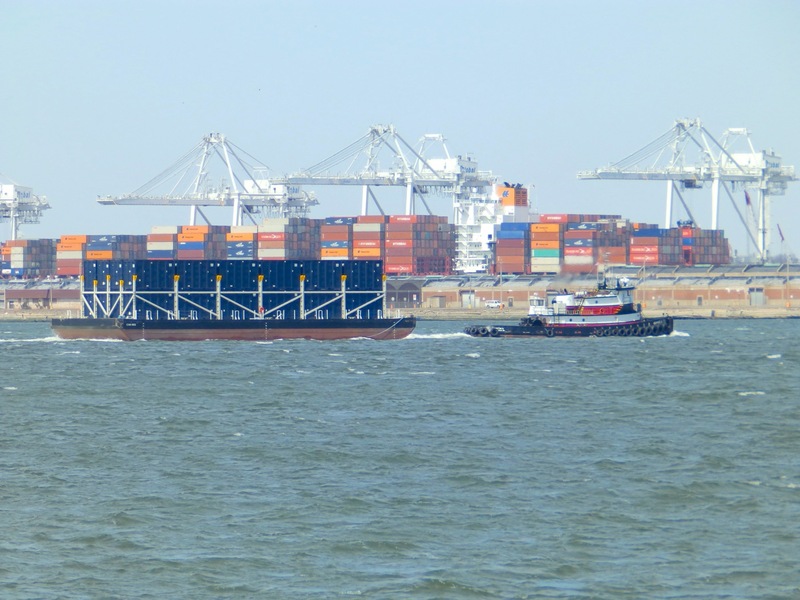 I took this photo as Captain D–a single 41-year-old tug–towed the 48 empty containers out of the Kills yesterday. 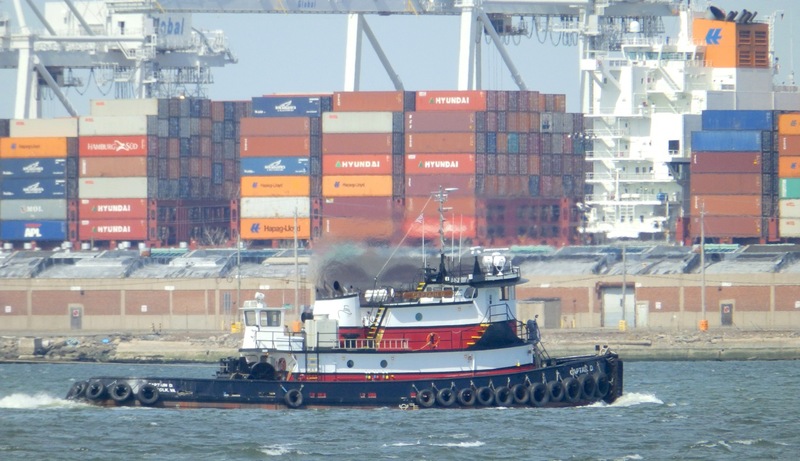 So if you needed another reason to love tugboats . . . Here and here are more articles on moving garbage this way. If you think “untruckster” doesn’t work as a name for this transportation system, con side the history of the word “dumpster,” here. 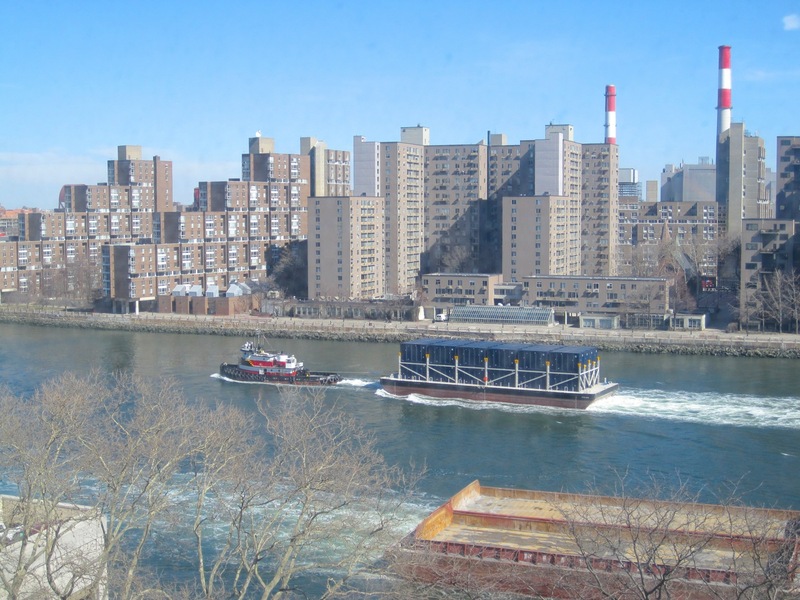 Many thanks to Jonathan for his photos from the East River. Any photos he didn’t take . . . came from Will Van Dorp. 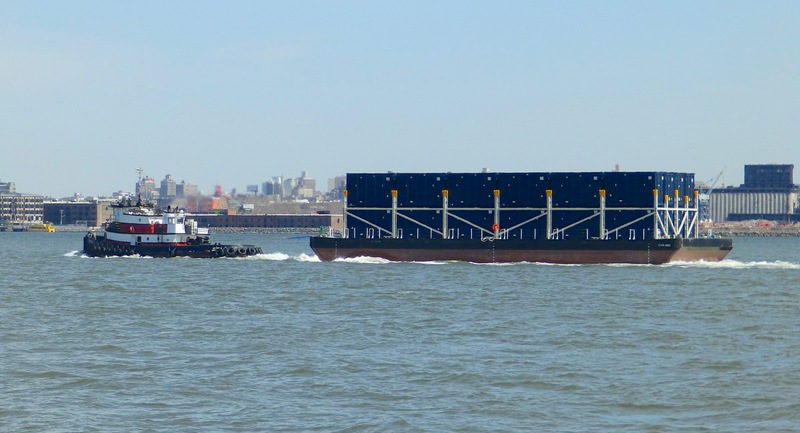 Those barges unload at the Howland hook terminal, all the way to the south by the bridges. Do they go on rail at Howland Hook? The trash cans are loaded directly to rail at Global marine terminal,Howland Hook.